I know, we have passed the Happy New Year hype, but this is only the second week of 2019, so no problem about the timing. Financially, it was our best year. Even having some moving expenses, we were able to save/invest almost half of our income. I chose the word Patience to guide me during this year. And let’s see what 2019 brings to us. Happy New Year! I had to customize the items of a select input field for timezones in a form. I needed to show some preferred US timezones first and then list the remaining below them. My mentor sent me this link to help me and I want to share it with you. So first we have a list of the preferred timezones, then we use the | operator to show those first and after that, show all the US time zones that aren’t included on the priorities list. Whenever you have a similar problem, you can follow this approach. Hope you liked it! That means you can modify them as you need and being aware of those breakpoints is pretty useful, including when you want to show or hide some content dependig on the screen size. Hope you liked this. I was really impressed of how Boostrap 4 has made our lives easier. Enjoy it! I’ve been studying more of Ruby from RubyTapas and I even got back to an old project of mine, the RubyFarm. I’m here today to show one really cool thing that I learned today: how to personalize the new method. 1 – Allocate a new, empty object of the given class. Hope you found that as awesome as I did when I learned this. See you next time! I am a junior back-end developer who recently discovered the exciting world of UX. If you take a look at my posts, you can see how passionate I am about working with Technology. I’m also aware that our industry lacks discussing relevant topics such as mental health, diversity (beyond race and gender) and accessibility and how important initiatives that aim to change are necessary. When I was studying Computer Science in Brazil (only did one year and a half), I worked on an undergraduate research using Python and Arduino to create a game prototype for children with visual impairment issues. The idea is to have some physical pieces that would allow them to learn the basic of Math equations by playing with them. The computer gives instant feedback for them and it was an amazing journey to work on this. I have an article (this was the very first MVP, later) and the code is on my Github. I also made the course Design and Make from Girls in Tech. I prototyped a dice that suggests some boost-mood activities for people who struggle with anxiety and depression, helping them to motivate to do their daily activities. I wrote about this process here, in case you want to check it out. And I would say what I love more about the web is how we can create things from nowhere, just using our creativity to solve real-world problems. And how using Technology can bring those solutions to a large number of people. A funny thing about my tech journey so far is that up until now, I always thought that being a back-end developer and a UX enthusiast were exclusive interests but… I couldn’t be more wrong! In fact, thinking on the whole process turns my life as a developer even better because now I try to think on the whole process and how to make the user more comfortable with what I am building. Write more and Speak at tech events. I like to share what I’m learning because it’s really hard to put all the pieces together when you are a beginner and people often assume you should already know stuff. And that’s all, folks! While I was reading this, I realized how my interests have changed… and that is awesome! Until next time! I did the Girls in Tech Design and Make Course (by Autodesk) a few weeks ago and I’m here to share my experience (and hopefully inspire you to take this course too!). I didn’t know before, but Girls in Tech have a platform called Global Classroom where you can sign up for different courses. Don’t forget to check it out! The modules, the links, the extra materials… everything about this course was really well put together. We learned all the process involved in using Technology as a tool to solve problems, rather than an end itself. I must say that I became fascinated with Product Design and 3D Modeling after taking this course. The main topics that we discussed were Product Design, Prototyping, and Iteration. We had to gather data and inspiration on a challenging issue, think of a Design Concept and iterate on different versions of the prototype after getting feedback and experimenting. I made some research on CBT – Cognitive-behavioural Therapy. I wanted to create something that would help people facing a cycle of negative thoughts or lacking motivation. This is something that I personally am familiar with and I wanted to explore this theme. I first thought about creating a board game where you could identify your cognitive distortion and prevent you to get into the cycle of negative thoughts and a dice to suggest mood-lifting activities. But I realized that I would need more time to practice my 3D skills to model both, so I eventually stuck with the dice. This is something that I’ve been learning after reading Feeling Good, by Dr. David Burns: action must anticipate motivation. It helps when I feel like not able to do nothing or just wanna stay in bed, so I can roll the Boost my Mood and do one of the activities to cheer me up! You can see by the next images that I’m not much skilled at drawing, but hey, we all need to start at some point, right? Here you can check the first version of my 3D model. As our final assignment, we had to submit a presentation, a kind of a summary of our previous 5 weeks of work. (I didn’t model all the icons, there is this repository where you download 3D models for free called Thingiverse. It helped a lot. That was a great resource because otherwise, I would take more time to model all of those icons :P). It was an amazing experience, I’m really grateful for this opportunity. The idea of thinking about a problem, creating a product and having it in your hand, is something that I could never think of before. I encourage you to try this process by yourself and let me know if you want to share it with me. Cheers! Rails Girls Summer of Code is a great way to practice your code skills after attending to one of the Rails Girls workshops. 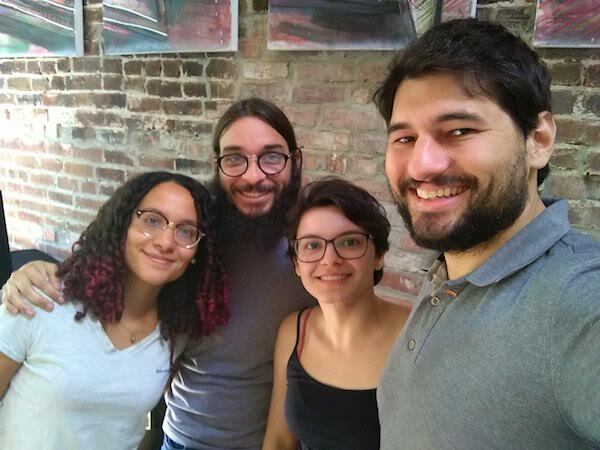 You can work on an Open Source project during the Summer, having a whole team to support you: teammate, a mentor, coaches and a supervisor to support you during this journey. I still get excited when I remember that this program is totally funded by the community (and also some cool sponsors!). I am so happy to say that my team, Brazilian Housewives coding, was accepted this year! They recently posted my team Introduction blog post from the official blog in Rails Girls Summer of Code. Check it out the other team’s posts there too, they are all amazing! Hello! We are Stefanni and Camila, two junior software developers from Brazil, based in Vancouver, Canada. We didn’t know each other before the RGSoC and we are more than happy to introduce our team! I am a millennial that likes to cook, coding, cats, playing sports and eating chocolate. I moved to Vancouver in January because my husband received a job offer to work here and we brought our two cats with us. My history with Rails Girls began in 2015. Actually, Rails Girls is the reason I decided to start Computer Science college in 2015 ( I only did 1 year and a half, now I am studying by myself). I went as a student in the Rails Girls Sao Paulo 2015 workshop and since then I wanted to join the RGSoC, but I never applied. I was also a coach on the 2017th edition and it was an amazing experience. The other coach of my group introduced me to the CTO of a Brazilian fintech where later I did a brief software internship before moving to Vancouver. So imagine how happy I was when Ana and Vaishali surprised us announcing that we were selected, Rails Girls has been playing an important role in my tech career! Hello everybody, my name is Camila! I’m a Brazilian living in Vancouver with my husband. After finishing our master’s degree in Computer Science last year we came to Canada with our two cats – the flight was a great adventure! During graduation I worked with Recommender Systems, characterizing the consumption over time in recommendation domains, and in social network analysis. In my master, I was interested in understanding how sociological aspects are reflected in current technologies, such as the existence of racial bias/stereotypes in search engines, and what is the role of the algorithms on the propagation of these bias/stereotypes. I’ve been working with academic research since my first year as an undergrad student. And my plan was to finish my master’s degree and then apply for a Ph.D. But for now, I feel the need to apply my knowledge to something that is really going to be used by several people and not only in the academic environment. I learned to code in my early years of graduation and I have a good experience with algorithms. I have good knowledge of Python, C, R… But I have almost no experience in software development, software engineering, testing, etc. So I think the Rail Girls program will be a great opportunity to be part of the Open Source community and learn a lot! Because we are both relatively new to Vancouver, it was difficult to find a teammate here. So we used the RGSoC google groups to search for teammates and there was where we met each other. We went to a coffee shop and discussed our application and we soon got along, especially because we both have cats =). This week has been great! We are reading and collecting information from the Public Lab codebase and the API docs/tests. Also, we focused on learning more about Git, RESTful API’s, and how to document code changes. We also want to thank the Predictable Revenue for letting us use their space to work. Thiago, one of our coaches, works there and we asked if we could work there. The office is great and it’s located at the historical site of Vancouver, a central location in the city. Thiago Araujo and Julio Albinati. Thanks for being our coaches, we couldn’t be part of this amazing program without your help. One of the reasons we applied to work at Public Lab is because it’s a very inclusive and supportive community. Jeff Warren is always helping us and we are happy to be part of it. Mayar is our RGSoC’s Buddy and we want to thank you for all your support and advice for us to have a great summer of code. We are working as a part-time team on the Public Lab app, more specific on the API feature. We have a Planning Issue here with the Timeline and a Github Project page if you want to check out and/or give some help and tips 🙂 We don’t have much experience working with API’s so we are really excited to learn everything that we can this summer. So, why Brazilian housewives coding? What do we expect for the RGSoC 2018? When I was reading Deep Work, I added a few books in my to-read Bookshelf and one of them was Peak: Secrets from the New Science of Expertise, from by K. Anders Ericsson and Robert Pool. It is, so far, one of the best books involving psychological research and concepts that I have read (the other one is ‘Thinking, Fast and Slow’, by Daniel Kahneman). It’s not my intention here to resume the book or to discuss every concept of it (there are so many!!). But to give you an idea, the book discusses how to be an expert in a given field through a deliberate practice, building mental representations, having the support of your significant ones and other variables. Now I want to share with you my best part of the book. It’s the chapter 8, ‘But What About Natural Talent?’, specifically, the section called ‘The Dark Side of Believing In Inner talent’. It demystifies the belief of someone being gifted or being talented by nature and because of that, they are good at what they do. When people assume that talent plays a major, even determining, role in how accomplished a person can become, that assumptions points one toward certains decisions and actions. If you assume that people who are not innately gifted are never going to be good at something, then the children who don’t excel at something right away are encouraged to try something else. The clumsy ones are pushed away from sports, the ones who can’t carry a tune right away are told they should try something other than music, and the ones who don’t immediately get comfortable with numbers are told they are not good at math. And, no surprises, the predictions come true [… ]. Te prophecy becomes self-fufilling. In addition to this discussion, I think that this belief is more prejudicial in the STEM fields. I have heard so many times people saying: ‘there are some people who learn how to code really fast, they must be naturally good at it’ or ‘I don’t have a logical brain, therefore I can’t learn how to code’. Now I try to show them the learning from this book and hope that they will stop repeating that and will at least try to pursue their goals. In the long run it is the ones who practice more who prevail, not the ones who had some initial advantage in intelligence or some other talent. If you liked these quotes, then besides reading the entire book, you will also enjoy this free amazing and fantastic resources by Dr. Stephen Chew to apply to your practices. You are very welcome! Hope that you get interested in reading it and if you do, share here your thoughts of it. Or recommend me another book. Cheers! For me, the hardest part was finding a project where I felt welcomed as a beginner and comfortable with the technology used. I was looking at the Rails Girls Summer of Code projects and after some days, I started doing contributions to Public Lab and If me organizations. If I am in any position of giving an advice, I’d say to look out for projects that you feel comfortable and that makes sense to you and to your learning path. It probably isn’t a good idea to start contributing to the Linux kernel, if you are learning how to program, for example. Another thing that is helpful in this discovery adventure is to read the documentation. Providing a careful documentation usually says a lot about the team communication and organization. I like to follow these two guides from Lucas Mazza and Thoughtbot to help me with Git in my contributions. I recommend you to read these two before going further. It’s up to you if you want to create a new branch or work on your local master. I prefer always having a branch for each new feature. When we are done with our changes, the next step is to open a Pull Request to say that we want to merge our changes into the original code. Normally, visiting the Github project page after pushing changes from a local branch will put a notice with the branch name. But if that doesn’t happen, you can do that by clicking on ‘New pull request’ and search for your branch there. Note: If you aren’t done yet but you want to know if you are on the right path, you can always open a new PR to get some feedback. Just add a ‘[WIP] – Add new feature’ to its name and ask for a review. Because other people are making modifications to the code at the same time, our forked repository needs to get these changes frequently, so we will always have the updated code to work on. Now we have our repository updated and that will decrease the number of conflicts in the future. If conflicts happen, it’s not the end of the world. Git usually provides helpful messages about the errors to guide you while solving them (and Google, always). After doing your first Open source contribution you’ll likely find out that the code that you change is just half of the work. You need first to communicate with the team, see if you understand the problem and ask for help, for example. But don’t worry if you don’t feel ready to do any of this. Don’t let that hold you back. If the project you choose is beginner-friendly, the team will help you with anything that you need. Besides, you’ll learn a lot from this experience, trust me. And that’s it for today. I hope you find this Guide useful. If you have anything to suggest or add, please, add a comment below 🙂 See you next! This got me thinking about how hard it is for us, humans, to change. This isn’t my first moving, in fact, this is the 4th time I am moving to another city in the past 10 years. You have to start everything again: meet new people -hopefully, make a new friend- learn the culture, habits, etc. But you don’t need to move to another country to change any aspect of your life. No matter what it is, you have to show up and say to the world what you want. The best opportunities that happened to me was because I pushed myself to go there, even when I was in doubt. I am not saying every opportunity will be great, but at least you’ll learn something from the experience. Don’t think I didn’t feel scared. I was, but I am feeling better about my choices since I started trying to think about what could go right, always. You should try it.